In a room formerly occupied by a pharmacy in Oak Forest, steel-reinforced walls protect sensitive computer equipment that manages data carried on the new Chicago Southland Fiber Network. Intended to offer high-speed Internet access to municipal governments, schools and businesses in the south suburbs, the fiber optic network also presents a potential economic development tool for the region. While it’s not something residential customers can tap into, the network could provide a boost in communities where high-speed broadband isn’t readily available or is financially out of the reach of businesses. the South Suburban Mayors and Managers Association to oversee it. Completion of the network “puts the south suburbs on the high-speed data map,” said Urban, whose company provides broadband Internet and wireless broadband services. 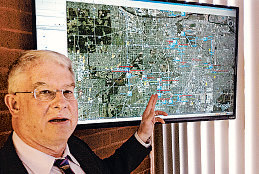 So far, Monee, Governors State University, South Suburban College, the Tinley Park Convention Center, Oak Forest Hospital and the Markham courthouse are using the network, but many other area communities, schools and businesses have expressed interest, according to Urban and Ed Paesel, executive director of the mayors group. Work on the network, which comprises about 70 miles of fiber optic cable, began in 2012, and GSU was the first to go live in February of this year. Funded in part with$6.1 million in state grant money, the network grew out of a 2009 study by Paesel’s group and Northern Illinois University that found disparities in access to high-speed Internet. Suburbs clustered near Interstate 57 were “particularly underserved,” Paesel said. Depending on the community, high-speed broadband “either wasn’t available or it was very expensive,” he said. From an economic development standpoint, broadband service “is as important a part of infrastructure as water, sewer and roads,” Paesel said. Urban’s company recently had 150 people attend a formal unveiling of the network and tours of the data center where traffic on it is managed. It was also an opportunity to sell other potential users on the network’s benefits, and Paesel,who is vice chairman of the network’s board of directors, said “a lot of one-on-one meetings” are planned with community officials, schools and business owners. He said an “old-fashioned marketing campaign” is underway to pitch to potential customers, but Urban said the plan isn’t to sign up a bunch of customers in a short period of time. The Tinley Park Convention Center is in the implementation phase of a one-gigabit connection to the new network, which will enhance broadband services, said Daniel Fitzgerald, director of sales and marketing for the center and adjacent Holiday Inn. bank loans. He said he hopes the money will be recouped from revenues generated as more network customers come online. with an inert gas, rather than water, to snuff the flames.